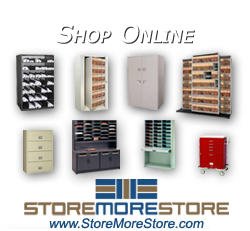 Filing systems, filing solutions, and high-density tab file systems have been a specialty of Southwest Solutions Group in Texas since it was founded in 1969. These space efficient filing and storage systems save two to three times the floor space of your filing system over traditional file cabinets. Use 1/2 to 1/3 the floor space and get the same filing capacity. This means you could lease or build less floor space, or use off-site storage less often for your filing system. A lot of our solutions have a Return On Investment (ROI) for a client in less than 1 year. These filing systems save space and with color-coded filing solutions they can increase productivity over 35% in your centralized file system. Let our team perform a no fee analysis of your filing area to demonstrate how a filing solution could make sense for you. Once a client sees how a filing system like this can assist them in saving file space, they never go back to traditional filing cabinets. 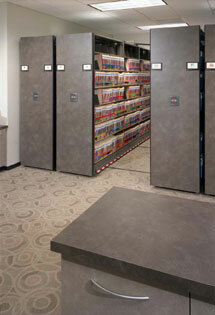 Did you know that the average filing cabinet costs more than high-density filing, and uses a lot more floor space? It is worth a look to see what over 5,000 other companies in Texas and Oklahoma have experienced in their filing and storage areas. These shelf filing systems will provide a state-of-the-art file solution for your team. 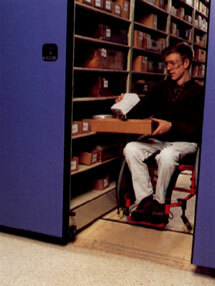 Mechanical Assisted Filing System have a ramp that meets the American Disability Act (ADA) slope of ramp. Visit http://www.ada.gov to see the ADA laws and codes. Systems like this are available on Texas StateContract (TXMAS) , U.S Communities Contract, GSA Contract , Healthcare Group Purchasing Contracts, Kansas State Contract, and many more.